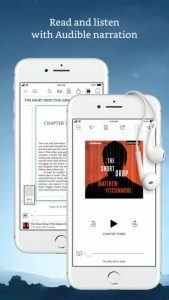 With your newsfeed you can discover what the readers you trust are reviewing and rating highly to find your next great read, and discuss the books, passages and ideas that inspire you while only being one tap away from diving back into your book. Prior to this Kindle release, my entire ebook library was in the cloud (more than 350 books). New books were also there, but also downloaded to my iPad so that, just the new books, were on the iPad/iPhone separately making them easy to find when I was ready to read them. When I finished reading a book, I removed it from my devise back to the cloud leaving the remaining unread books on the iPad. Now, they are all together, all 350+, making it difficult to find the new unread books. I think they have a check mark & a “new” banner, but still making them difficult to find in the 350+ book library. I have a lot of pre-orders I may cancel & go to iBooks. *would really love to see support for a scrolling option, which is very handy when laying in bed and resting a device on your chest. This is the main reason I stick with iBooks since I read a lot in bed before going to sleep. Also, where is the split-screen support on the iPad? Otherwise, a great app.